Rochelle's BEST chicken for over 45 years. Hamburgers, Fries, Gyros, Sandwiches, Seafood, Italian Beef, Sausages, Shrimp, Cod and more. Open every day at 9 a.m.
16 different flavors of Ice Cream. 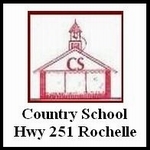 Country School Restaurant has the BEST lunch and BEST dinner specials in the "Hub City". Prices/Specials subject to change without notice.